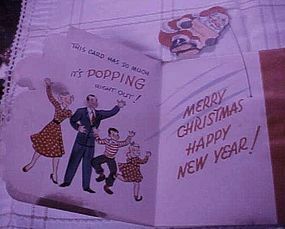 Simply gorgeous pop out religious Christmas card from the 50's. 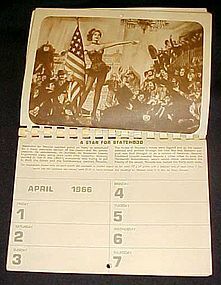 Comes unused with original envelope. Front says: Adeste Fideles, and when you open itThe pop out has the words(as if the angels are singing) to Oh Come all ye faithful. 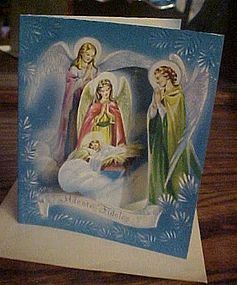 Card reads inside: May the smile of the infant saviour which so brightned the world with the promise of Salvation, Renew again our vision of eternity. PERFECT condition. comes with original envelope. 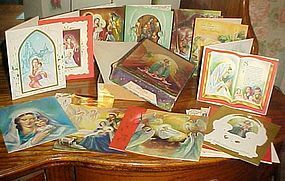 Awesome vintage Christmas card is a pop up. The three carolers are singing "Should auld aquaintance be forgot?" 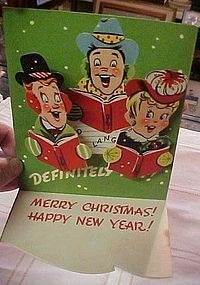 Open the card and the carolers pops out with "Definately Not!! Merry Christmas Happy New Year". Measures 5 x 6. Made by Holiday Humor. Including the original envelope, but it will have to be steamed open and has a corner stain. Unused card with no writing or rips, but there is a corner stain on the card also . 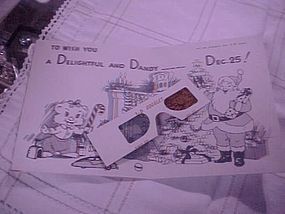 Awesome vintage Christmas card is a moveable action card. Her face moves and the hat lifts out of the box. The little lady is surrounded by Christmas gifts and the front says "Hi Gorgeous! Hope Christmas". 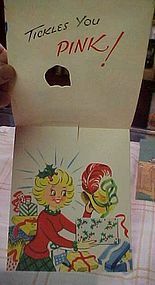 Open the card and she is opening gifts, and her face moves an the hat comes out of the box" Nd it says "Tickled you pink!" Measures 5 x 6. Made by Holiday Humor. Including the original envelope, but it will have to be steamed open. Unused with no writing or rips. Awesome vintage Christmas card is a pop up. The little Secretary sits at a desk and says "Season's Greetings Like to take DICTATION? Well here comes some your way~". 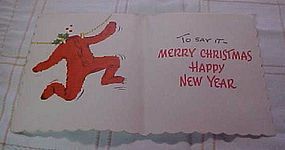 Open the card and he pops out with Enjoy yourself and have a Merry Christmas". Measures 5 x 6. Made by Fun A Plenty. Including the original envelope, but it will have to be steamed open. Unused with no writing or rips. 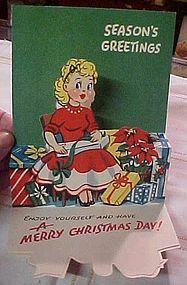 Neat vintage Christmas card is cute. Pair of long wooly red flannel underwear on the front, and says "Just itching". 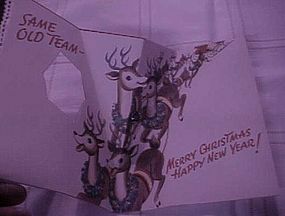 Open the card andand says "TO say it_ Merry Christmas Happy New Year" Measures 5 x 6. Made by Fun A Plenty. 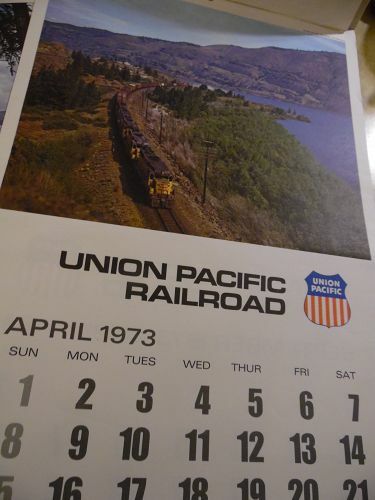 Including the original envelope, but it will have to be steamed open. Unused with no writing or rips. 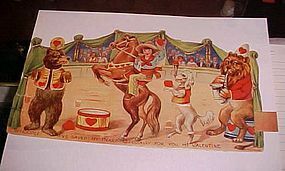 Vintage 1950's Christmas card VERY SOXY!!!! 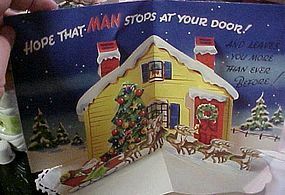 Awesome vintage fun suggestive Christmas card . A colorful pair of Christmas stockings on the front and it reads "This wish has SOCKS APPEAL". 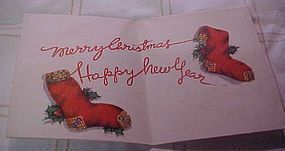 Open the card and there is a pair os socks and it says "Merry Christmas Happy New Year" Measures 5 x 6. Made by Fun A Plenty. Including the original envelope, but it will have to be steamed open. Unused with no writing or rips. Christmas cards don't get more Soxier than this one! Awesome vintage Christmas card is a pop up. 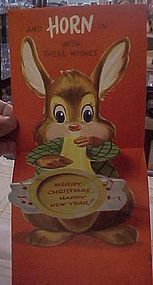 The little bunny is blowing a horn, and the front says "Seasons Greetings Time to blow the works". 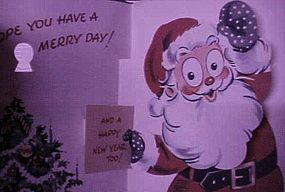 Open the card and he pops out with his horn and the inside says "And Horn in with these wishes, MERRY CHRISTMAS AND A HAPPY NEW YEAR. Measures 5 x 6. Including the original envelope, but it will have to be steamed open. Unused with no writing or rips. Awesome vintage Christmas card is a pop up. The little Mailman carries a large delivery of christmas mail and says "Get a load of this". 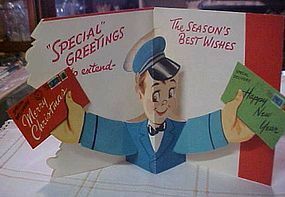 Open the card and he pops out with Christmas mail in each hand and says" SPECIAL GREETINGS and THE SEASONS BEST WISHES. 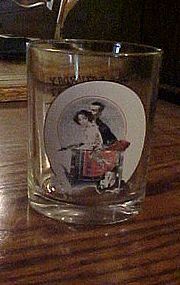 Measures 5 x 6. Made by Fun A Plenty. Including the original envelope, but it will have to be steamed open. Unused with no writing or rips.